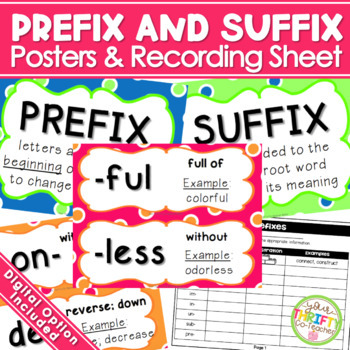 This Prefixes and Suffixes Posters Resource includes a total of 15 prefixes and 13 suffixes. It contains a prefix title poster, a suffix title poster and mini prefix and suffix posters. There are four different color sets available in this product. You may choose to print one color set, or mix and match them. There are also blank mini posters available to write your own prefix/suffix with definition and example. 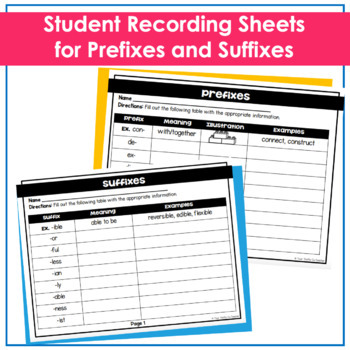 It also includes a student worksheet that students may use to fill in as the teacher introduces the suffixes and prefixes, or as a review assignment. "Nice touch to put in different color combinations. That way I can change it up if I redecorate. 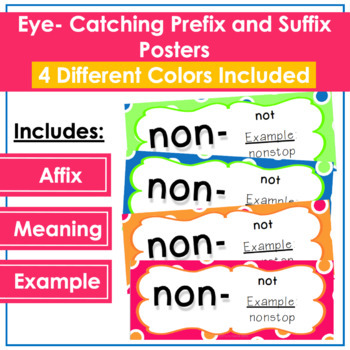 Perfect combination of helpers for teaching suffixes and prefixes." 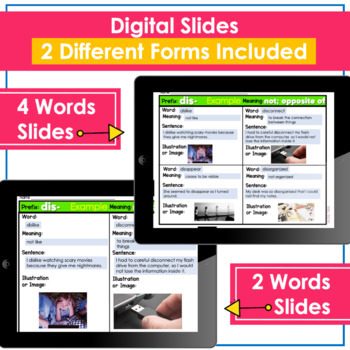 "Perfect for my word wall and helpful for their word work station. Thank you!!!" "We had so much fun with these cards, and then put them up in our classroom! They are just perfect!"